Hi All! Just a quick update to say that I added a tid bit about spray basting at the end of my recent basting tutorial, click here (then scroll down). It’s a quick alternative to pinning together all three quilt layers. I’m sure you all can agree that basting a quilt is the least fun part of quilting :-|, so anything that helps make it go by quicker is always a plus! I’ve spray basted before and have been very pleased with the results. Just wanted to share this with you in case some of you have never heard of it, or perhaps you have, but were skeptical of the method. Have a great week, and as always, Happy Quilting! 11 Responses to Have You Tried Spray Basting? It's toxic but it's good! Love it times two! I'll need to try 505 spray. The video tutorial I posed on spray basting recommended that brand as well. Thank you! I had SUCH a disappointing experience with spray basting. Be SURE you follow all directions explicitly. I love spray basting….that's pretty much the only way I baste…sometimes I use pins, too, but mostly just the spray. Have used 505 before but it is costly and I can deal with the fumes ok. I started spray basting about 5 years ago and haven't looked back! If I am going to quilt something on my domestic machine, it is spray basted. The only time I don't spray is when I have something large that I am quilting on the long arm. I have a large old bed sheet that I put down under the bottom layer to catch any over spray. I use the June Tailor spray because I can pick it up for half price at Joann's with a coupon. I spray and pin! I love 505 and now there is a 606 I believe, but I haven't tried it though I will when my 505 is gone. I love that I can use it then if something isn't right I can lift and reposition til it is right then I pin, but I don't use as many pins as I would without. If I am doing a small project I use only spray. I have tried it a few times. I love how it works. How do you keep it from getting all over every thing else? It gets everywhere! I love spray basting, mainly because I hate basting! I use a few pins as well on bigger projects and I have wondered how long the spray would hold if, for example, you were hand quilting over a long time, but for machine quilting it holds fine. I could not quilt without it! When I started quilting last year i had no idea how to baste and my husband found this basting spray (same brand actually) at JAF's. And now I can actually quilt the layers without it shifting so much. I still add a few safety pins for large projects just in case. 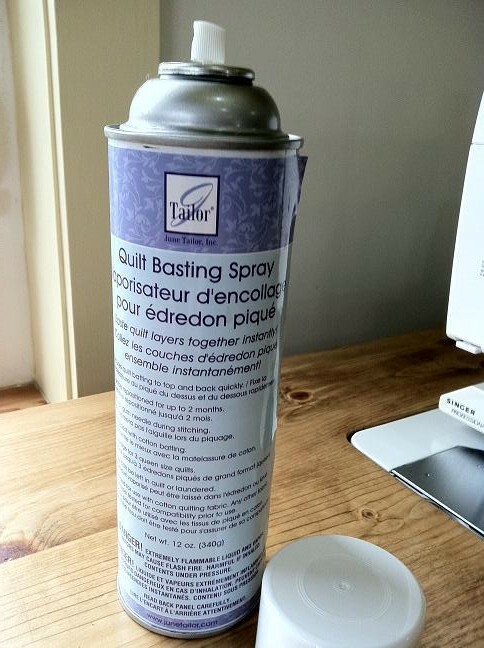 I've been using spray for basting for a long time for all sizes of quilts. I would like to get a set-up to do it on the wall like the video because it sure looks easier, but for now, I use my kitchen floor. If you get the spray on your floor, I find the best thing to help clean it up is baking soda and a wet rag.